The BTP10's body is carved from CNC milled titanium alloy with a thickness of 1.8mm making it almost unbreakable het elegant and aesthetically appealing.With its Tungsten Steel Tapered Tip The BTP10 doubles as a window breaker and a self-defence tool in close quarters combat (CQC). A hollow-carved body ensures a comfortable grip and reduces weight for increased portability. 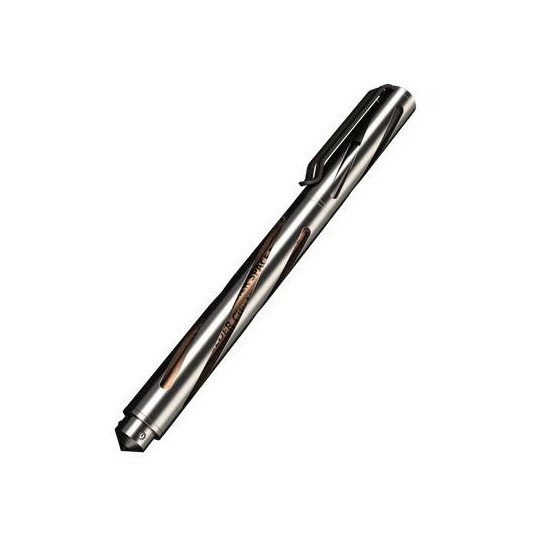 Titanium Alloy Clip inserted into the cap, the NTP10's clip effectively prevents loosening and loss.Three stop pins allow the cap to be mounted on the tapered tip during use.Titanium Cap - Polyflan interior, featuring low coefficient of friction, good resistance to heat, acid and alkali, protects the tip of the pen. Adjustable linner barrel to accomodate minor difference in refill length.Matt aluminium alloy pen case acts as a protective cover or a gift box.Fisher Space pen - An included Fisher Space Pen pressurized refill ensured a smooth pen stroke on almost any surface and in any environment while also preventing ink leakage or evaporation.Extremely lightweight and portable, weights only 18.2 grams.